Well guys I have been SERIOUSLY slacking this month on writing blogs but I have no real good excuse for it. I’ve been enjoying books (something I haven’t had time to do in over 2 years) and spending time outside. In any case, here is a little bit about Lima, Cusco, The Sacred Valley, and Machu Picchu. Lima is our favorite capital that we have visited. I had not heard very good things about Lima, so I didn’t have high hopes but it was great fun for us. We stayed right in between Miraflores and Barranco. 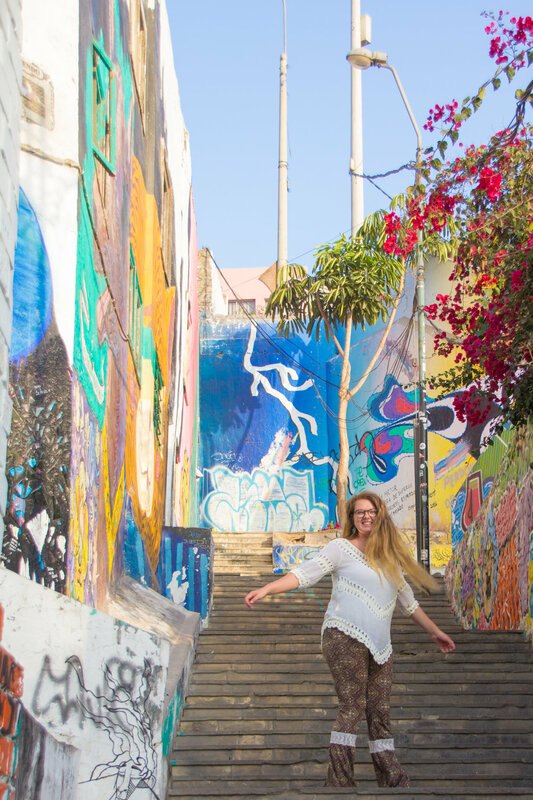 Barranco was by far our favorite part of the city with the boho-feel, colorful buildings, and art flooding the walls of every street. 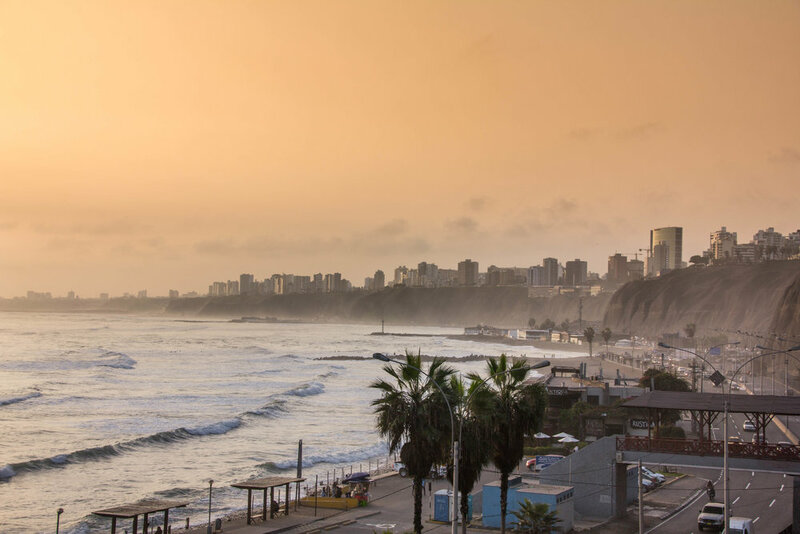 In Miraflores there is an abundance of parks along the coast and we could spend all day walking though them watching the waves hit the bluffs. Lima also seemed like the most advanced capital city that we visited. Pretty much anything we needed we could find there. We felt safe and the neighborhoods were extremely walkable with public transportation very accessible. We chose to commute on foot most of our days and could easily walk 6-7 miles per day. This didn’t bother me at all, however when we went to Cusco walking around there was a very different story. Cusco sits in the Andes at 11,000 feet above sea level (about twice that of Denver). Even after being here 3 weeks, walking 1 mile here is harder than the 6 a day we walked in Lima. The headaches are real the first few days but staying hydrated and sipping Coca tea helped with that! Cusco is a very large city although it doesn’t have the amenities of what we think a city might have. It’s an old town and you get that feel when walking through it. Many of the buildings still have foundations from when the Incas built here. Cusco was the capital of the Incas and reminisce of them is still present in everyday life. They cut their stones so precisely that they had no need for mortar in-between. Additionally, the walls have a slight angle to them- they are not a precise 90 degrees, the walls all somewhat lean in towards one another to help hold each other up. Any building that has the stones perfectly stacked together like this is original Incan architecture. When the Spanish conquered the Incas they destroyed much of what the Incas had built. However they soon discovered Incan architecture was a much sturdier way of building then how the Spanish had built, and when you live on an earthquake fault line, sturdiness is important. This month the plaza has been full of teachers who are on strike trying to get better pay. In Lima the main plaza was also full of protestors speaking out against their president. It seems the people of Peru know how to stand up for what they believe in! Many women still dress in traditional clothing, speak Quechua, and sell things on the street for a living. This is partially due to not being able to afford decent schooling. Here in Cusco if you do not have a lot of money you cannot go to a good school and therefor cannot get a good job, leaving you to your own devices. I bargain a lot here, but I try not to be unfair to these people because what they are selling is generally cheap anyway and they are just trying to provide for their children (who are often sitting right there with them or are slug around their backs). Not far from Cusco is the Sacred Valley. The Sacred Valley of the Incas is where they grew most of their food for the surrounding towns because the climate in the lower elevation is better for crops (specifically corn) to grow. Additionally, the Urubamba River cuts through the valley giving a reliable source of water. The 4 towns that make up the Sacred Valley today are small population wise, but physical space is limited too with the average width throughout the valley being 1 mile. The towns in the Valley can best be described as magical. To wake up and walk out of the house to vast mountains in every direction is humbling, awe inspiring, and breath taking. The way the light folds around the sharp edges of the mountain and filters through the gaps is something indescribable. 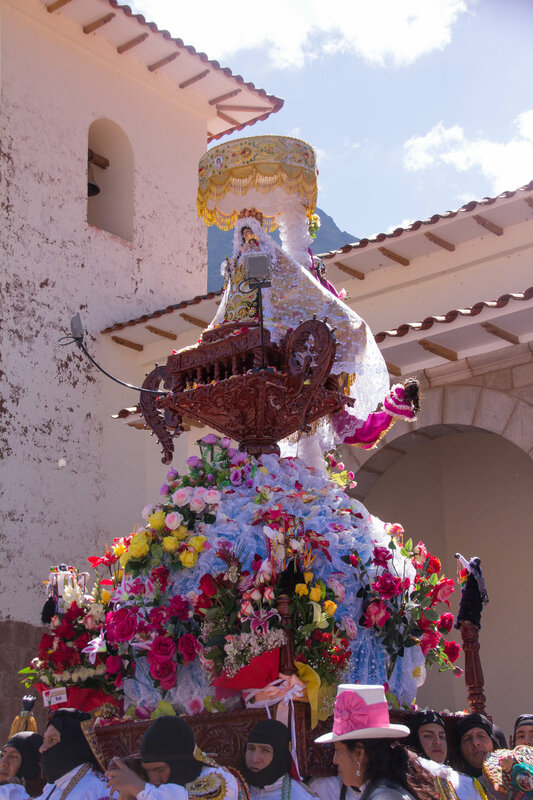 Pisac in the Sacred Valley is known for its Virgin del Carmen festival that happens once a year. This event is pure organized chaos, especially illustrated for us when we accidently got swept up with the parade. People come from all over to celebrate, and man do they know how to party. The festivities continue for days with traditional food, drink, parades, fireworks and activities taking place until sunrise. Their belief system is a quite interesting fusion between Catholicism and Incan tradition. This makes for a wildly good time and so many sights my eyes could hardly take it all in. Not far past the Sacred Valley, running the same path as the river is a town called Aguas Calientes. You can throw a stone across the whole town and really the only notable things abut here is the hot springs and that they are the closest city to Machu Picchu. If you are among the smarter bunch heading to Machu Picchu you either hike the Inca trail or stay in Aguas Calientes for a night so you can hike up early to be one of the first people in, and experience the sunrise. 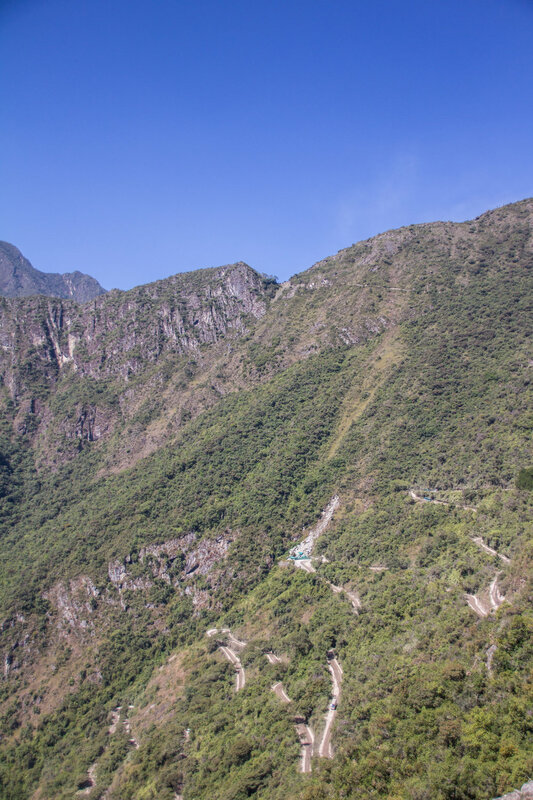 We, however, are not among those smart people- mostly due to the fact that we are over budget and didn’t want to spend the extra money on the hotel room- Aguas Calientes is a super tourist destination and prices are very inflated. Even so, we got our butts out of bed at 4am and headed to the Cusco train station. We arrived in Aguas Calientes around 10am and stood in line for bus tickets. Again, smart people would have ample time to walk the hour hike to Machu Picchu and save $24, but we had to opt for the windy bus road up (these buses are the only vehicles allowed up the mountain so don’t think you can get around the $24 by taking an uber). We arrived shortly after noon and strolled through the entrance along with every tour group in Peru. While the number of people that enter each day is high, it never feels crowded because of the enormous size of this place. We walked for 3.5 hours and saw most of it, but we could have easily stayed another hour. Machu Picchu it is believed to be a dwelling place created for/by the Incan ruler, Pachacuti. It is its own little city equipped with places for townspeople to reside, worship areas, gathering areas, sustainable farming, an irrigation and drinking system, as well as a way to tell the time and date. The Incas built Machu Picchu sometime around 1450 but it wasn’t discovered until 1911. When the Spanish conquistadores came they destroyed everything they could. Machu Picchu was the only thing left virtually untouched, leading the discoverer to believe that this was the Lost City of the Incas. Excavations have since proved otherwise, but the name has kind of stuck. But why did Pachacuti insist on his city being built here? It is an awfully hard place to reach, it rains preposterous amounts per year, and sits right on 2 fault lines- but the Incas had solutions for each of these problems. The first thing they did was build terraces to make the journey up easier, to help with the sturdiness of the city, and to prevent any flooding. The terraces and the foundation of the whole city acts as a filtration system rather than having a run off for water. Under the city they have a first layer of dirt, further under are small rocks, and deeper still are big boulders, allowing the ground to absorb the water rather than having it sit on top. We are led to believe this sight was chosen primarily because of its location near the holy mountains. The central stone of Machu Picchu not only corresponds to these mountains, but also aligns with the 4 cardinal directions. Additionally, the location is prime for giving the feeling of power. The top of the mountain is useful for seeing what’s going on below, helping to prepare for any attack and letting the people beneath know who is in charge. There is also granite deposit and freshwater stream running nearby that may have also played a role in why they deemed this location best. The stream pictured above was guided to flow through a series of fountains and pools throughout the town, and still runs today. 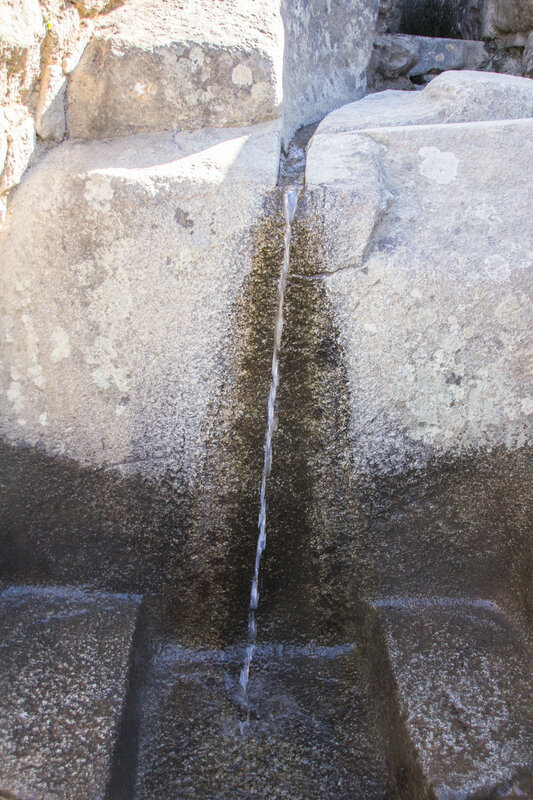 The first fountain/pool was built directly outside of the king’s house so he could always have the freshest water. Although Machu Picchu is truly spectacular, the best preserved, and the most astonishing of all of the places, there are an incredible amount of ruins from the Incas all around the Cusco region and beyond. I am astounded at how everything was built with such precision that many years ago without modern advances or even things such as mortar, metal tools or the wheel. Though they disappeared mysteriously all those years ago, their culture still lives on through the people of Cusco. I have 3 more blog posts that will be up shortly, but until then..
PEACE, LOVE, AND ADVENTURE ON!